@MikeRogers0: Todays drinking game, every time someone mentions a conference you drink. @andybeta Absolutely. I want the Twelve South BookBook, but I’m waiting it out. @Jordanmemari @edgain We did. Next one will be September something. Up for it? @Jordanmemari I could kiss you right now. Channels 1-8 same crap results, channel 9: perfect! I owe you a beer. @adam_greenough You using an specific apps? @virginmedia I’ve tried all of that. Two iOS devices, 2 macs and a windows laptop. None of them connect, or if they do, slow speeds (1/2mb). @richpmilner: Wi-Fi buses are about as necessary as Bluetooth porridge. Well, looks like I’ll be making a phone call to @virginmedia complaints department. The SuperHub is entirely unusable as a wireless router. @virginmedia I stand corrected. I still cannot connect wirelessly/if I do I get stupidly slow speeds. @virginmedia I am now. Had a few problems to begin with, but a reset did the trick. 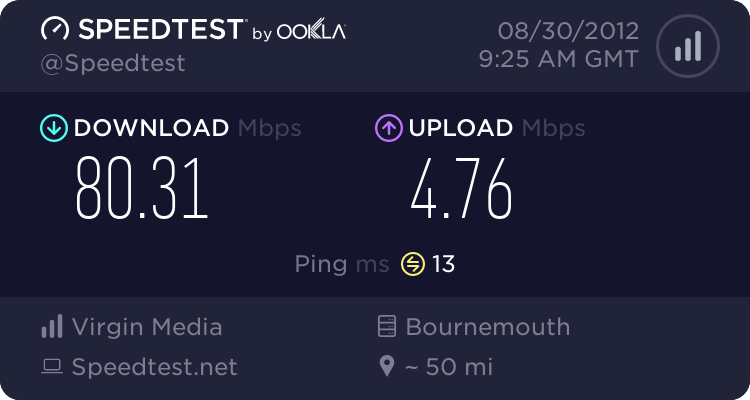 @tomoakley125 What’s your wireless speed like compared to wired? @tomoakley125 No idea, only had it installed this morning. Wireless speed is terrible. @Lletnek Unfortunately, the other devices are iPhone, iPad and MBA. None of which have ethernet. Great, 80mb on ethernet, 3mb on wireless. SuperHub my arse. @imyke Virgin sent me their SuperGitHub for the extra speeds. Just remembered why I never read comments on blogs. Wow. @MikeRogers0 Upload is still faster than what I had before though. Very happy. Virgin Media just turned up. Excellent. Yeahhhh it’s 100mb broadband day! Woohoo!!! @mattmc: The President knows about 'Not Bad.' Hmm. Hmm none of my iCloud documents are showing in Byword on my iPhone. But they still exist. That is all kinds of weird. 200 articles later, I have finally got to @instapaper Zero. Oh wow, One37 looks beautiful. Wonderful job, @mattalexand. For anyone following me on Foursquare: I am checking into places for the sole purpose of logging to Day One. I really don’t understand why @rickygervais tweets something, then deletes it later. Makes no sense. @_geNEROsity: Who is Neil Armstrong? @LukesBeard I’ve been using it since beta 1 with no issues at all. @pbakaus: Yes, the new native FB app performs well better. But was the slowness HTML5's fault? I don't think so. So when are Apple sending out the dressage team?